Fat is perhaps one of the most iconic substances of our time. It is integral to life, health, energy, beauty, ecology and consumption. Fat performs a unique and vital function as an energy reserve, stored within the body for times of scarcity. But what is fat if its ‘behaviour’ becomes unpredictable, overtaking not only our bodies but our sewage systems? Do we understand fat, or do we need a fresh perspective? 3 Days of Fat builds on Fatberg, an ongoing artistic research project developed by Thought Collider and Arne Hendriks, and draws on the latest research from King’s College London’s Department of Nutritional Sciences into saturated fat and the food industry’s novel fat interesterification process. 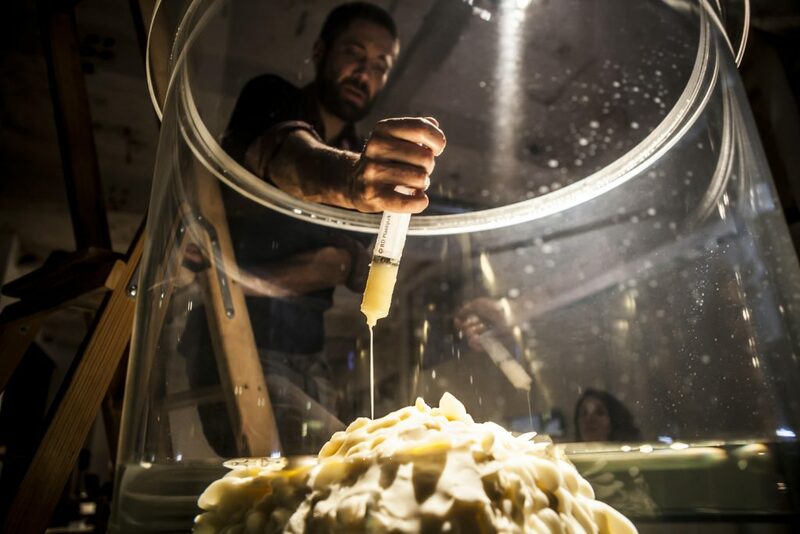 Over the course of three days this October the ‘fatberg’ – a floating island of fat suspended within its own tank – will be grown at King’s College London’s Arcade at Bush House and used as a focus for themed experiments, performances and discussions. 3 Days of Fat brings Somerset House Studios resident Thought Collider and King’s academics together with experts from art and culture, life sciences, food, agriculture and healthcare to grow the ‘Fatberg’ island and discuss our complex relationship with this substance. Each day will explore a different theme, including fat’s role in life and ecology, health and beauty, and energy, stimulating dialogue on humanity’s relationship with fat, what it is and what it might become. 3 Days of Fat 10-12 October 2018 The Arcade at Bush House, 30 Aldwych, King’s College, London WC2B 4BG. This entry was posted in EXHIBITIONS, NEWS and tagged Arcade at Bush House, art-science, King’s College London, Thought Collider. Bookmark the permalink.